The MPL4215 is an octal RS-232/RS-485 interface board on the G-64/96 bus. Up to eight channels RS-232 with full hardware handshake (MPL4215-1) or eight channels RS-485 (MPL 4215-2) are available. A third version with the first four channels RS-232 and the second four channels RS-485 is available on request (MPL4215-3). The interface device used is a popular and well supported device: 68C681. The MPL4215 can be accessed in the synchronous as well as in the asynchronous VPA mode. Vectored interrupts are supported to speed up the interrupt work out time. 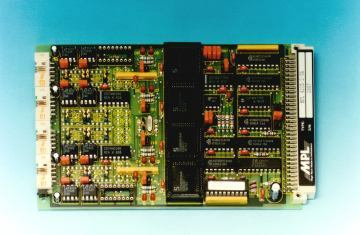 The MPL4215 can be used together with other vectored cards due to its 'interrupt daisy-chain' capability. The card is designed fully in CMOS and typically consumes 50mA (RS 485 version: 80mA) at +5V. Therefore the MPL4215 is well suited for applications requiring an increased number of serial channels concentrated on one card and/or low power consumption.